In 2016, my dear friend and colleague Maestro Rafael Mier were invited to give conferences in the Mexican state of Puebla. After our conferences, we visited the Biosphere Tehuacán-Cuicatlán, important to the world for numerous reasons. Mexico Cooks! wrote then about the discovery of corn, the reason most important to Mstro. Rafael and to me--a reason important to you, as well. At first glance, these appear to be flowers--but look closely: they're actually cross-sections of different varieties, sizes and colors of maíces nativos (native corn), grown continuously in Mexico for many thousands of years, right up to the present time. They're so beautiful--and delicious! 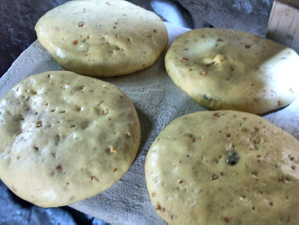 Photo courtesy Tortilla de Maíz Mexicana. A few weeks ago, CONACULTA (Mexico's ministry of culture) invited Maestro Rafael Mier and Mexico Cooks! to speak about the preservation of traditional tortillas and about the milpa (millennia-old sustainable agricultural method still used in Mexico) at the Second Annual Festival Universo de la Milpa, held this year in Santa María Coapan, Puebla. Santa María Coapan, a part of the municipality of Tehuacán, is at the epicenter of the documented-to-date 11,000 year history of corn. Left to right in the photo: Maestra Teresa de la Luz Hilario, Regidora de Educación y Cultura de Santa María Coapan; Maestro Rafael Mier of Tortilla de Maíz Mexicana; Mexico Cooks! ; (speaking) the humanitarian and life-long human rights abogada del pueblo (advocate for the people) Concepción Hernández Méndez; and at far right, Lic. Roberto G. Quintero Nava, Director General de Culturas Populares of Puebla, CONACULTA. It was an honor to be part of this event and to meet its outstanding participants in this center of Mexican corn production. Photo courtesy Rafael Mier. In tiny Coxcatlán, Puebla (just down the highway on the road south out of Tehuacán), a main attraction is the monument to corn. The legend at the base of the recently refurbished monument reads, "Coxcatlán, Cuna del Maíz (Cradle of Corn)". All photos copyright Mexico Cooks! unless otherwise noted. From the small town of Coxcatlán, our driver took us about five kilometers further, south toward the Oaxaca border; there's a turnoff onto a dirt road at the Tehuacán-Cuicatlán Biosphere Reserve. The September 24, 2016 Mexico Cooks! article offers some fascinating general information about the biosphere. If you didn't know to turn onto that poorly marked, narrow, and winding dirt road, you'd just keep whizzing along the highway, saying, "Nothing to see here, just a lot of big cactus and scrub trees. The Oaxaca border is only 30 kilometers away, let's hurry so we get there before dark." But this humble dirt road twists through a portion of an internationally important site marking the origin and development of agriculture in Mesoamerica and the world. Archeological research here has provided key information regarding the domestication of various species such as corn (Zea mays sp. ), chile (Capsicum annuum), amaranth (Amaranthus sp. ), avocado (Persea americana), squash (Cucurbita sp. ), bean (Phaseolus sp. ), and numerous other plants that are with us still in the modern era. This biosphere is home to just under 3000 kinds of native flora plus the largest collection of columnar cacti in the world. In addition, the biosphere contains approximately 600 species of vertebrate animals. Let's not hurry--let's spend some time here. Archeologist Richard S. MacNeish (April 29, 1918-January 16, 2001). In 1965, Dr. MacNeish and a group of his colleagues first uncovered the agricultural treasures in the Tehuacán-Cuicatlán biosphere. Their excavation resulted in some of the most significant agricultural finds in the world. A statue in his memory is prominent today in Tehuacán. Dr. MacNeish, one of the most outstanding archaeologists of the Americas, developed innovative field methods that allowed him and his teams of co-archaeologists, anthropologists, sociologists, agronomists, and others to use science rather than educated guesswork to locate potentially important sites for excavation. Other than his discoveries in this biosphere, which are crucial to our understanding of Mesoamerican agriculture and settlement, his greatest legacy is probably his influence on and encouragement of students, other archaeologists, and the multitude of scientific professionals with whom he worked. Photo of Dr. MacNeish courtesy LibraryThing. My good friend and colleague Rafael Mier, founder of Tortilla de Maíz Mexicana (by all means join the Facebook group), had talked a good while with me about his desire to visit the site where, over 50 years ago, Dr. MacNeish documented the remains of ancient corn. The more we talked about going to the cave, the more my heart raced: We were going to visit one of the places in Mexico where corn was born. Where corn was born. I felt that the trip would be much more than a Sunday drive in the country: it felt like a pilgrimage, to the most basic food destination in Mexico. To the origin of everything. The extremely ancient peoples of what is now Mexico domesticated a native wild-growing plant called teocintle, which over the course of many years became what we know today as corn. Teocintle--the photo above is a seed head of the plant, harvested in 2015 in the State of Mexico and framed in sterling silver--is a grass similar to rice in that the grains grow and mature as a cluster of individuals, on a stalk. A mazorca (seed head) of teocintle has no center structure; no cob, if you will. One of the primary features that distinguishes corn from teocintle is the cob. Scientists tracked the domestication of teocintle from the wild grain to its semi-domesticated state, and from semi-domestication to the incredible variety of native Mexican corns that we know today. The actual teocintle seed head in the photo measures approximately three inches long. What you see in my hand is the million-times-over great-grandfather, the ancient ancestor of corn. The mouth of la Cuna del Maíz Mexicano (the cradle of Mexican corn). I grew up in the southern United States, where I knew a few caves. I had expected to see a cave along the lines of Wyandotte Caves in Indiana, or Mammoth Cave in Kentucky: huge, multi-room caverns in which a person can walk along seeing rivers, stalagmites, stalactites, and other underground cave formations. Not here; this cave is simply what you see in the photograph, a sheltering karst-formation in the limestone, a pre-historic bubble. Standing in this spot gave me chills, and simply thinking about it while looking at the photograph now makes a shiver run up my spine. Out here in the vastness of this ancient natural world, in some ways so similar to the primitive world into which corn was born, one forgets about the crowded city, one forgets about modern problems, and one returns both mentally and spiritually to another time and to a connection with those Stone Age people who gave us the gift of corn, the true staff of life in much of today's world. This shelter, according to years-long archeological research by Dr. MacNeish and others, was used as a camp, as a shelter during the rainy season for as many as 25 to 30 people, and as a post-harvest storage place for corn and other native vegetables (corn, beans, chiles, etc). Families, bands of families, and tribes living in or traveling through the Coxcatlán area used this type shelter for 10,000 years or more, primarily during the time in Mesoamerica that is analogous to the Archaic archeological period: approximately 5000 to 3400 BCE. Dr. MacNeish's extensive research showed more than 42 separate occupations, 28 habitation zones, and seven cultural phases in this cave. 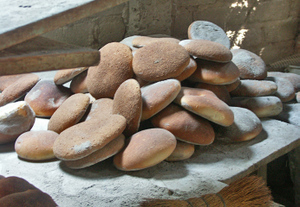 At the Museo del Maíz (Corn Museum) in Tehuacán, there is a small display of the original dehydrated corn cobs as well as some utensils found in the cave in the biosphere. This tiny cob measures less than one inch long. 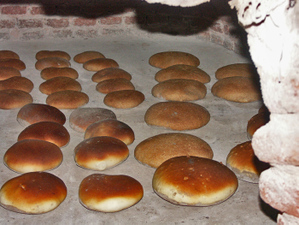 These dehydrated cobs, also found in the cave, are quite a bit larger and probably somewhat younger than the tiny one in the photo above. They measure between 2 and 3 inches long. Some ancient fingers plucked this corn from its stalk, some long-ago woman--she must have been a woman--removed the kernels from the cobs and prepared food. How similar the growing methods, how similar what they ate, those people who created corn from a wild plant. Corn, beans, chiles, squash, amaranth, avocado: all served up in some way for millennia-past meals, and all available in Mexico's markets today. What foods do you eat that nourished your Stone Age forebears? How precious it is to know and taste the flavors of 7 to 10 thousand years worth of comidas (Mexico's main meal of the day)! In addition to the important finding of dehydrated corn cob specimens (nearly 25,000 samples) and other kinds of vegetables in the substrata of the Tehuacán cave, Dr. MacNeish and subsequent archeologists found a large number of ancient tools such as chipped-flint darts used for hunting, grinding stones, and coas (pointed sticks used for planting). The investigators also found approximately 100 samples of human feces, which were examined to document the human diet of those long-ago days. Thanks to carbon dating, a method of determining the age of organic objects which was developed in the 1940s, scientists were and continue to be able to assign dates to ancient artifacts. Part of a mural found in ruins dating to 650-900 AD in Cacaxtla, Tlaxcala. Click on the photograph to enlarge it; you'll see that what initially appear to be ears of corn are in fact a part of Mexico's creation myth: humankind is born of corn, and corn is born of humankind. Corn, which humankind created in the domestication process, cannot in fact exist without a human helping hand to husk it, take the dried kernels from the cob, and plant those kernels for subsequent harvest. Above even wheat and rice, corn is the single-most planted grain in the world; there are countries and regions where humans could not exist without corn. This tiny mazorca (dried ear of corn) is maíz palomero: (popcorn, scientific name Zaya mays everta), native to Mexico, the only kind of corn in the world that pops. Maíz palomero is believed by many scientists to have been the first corn. Today, this original corn is tragically all but extinct in Mexico. My colleague Maestro Rafael Mier, who lives in Mexico City, wanted to plant it; he contacted a number of possible sources without locating any seed at all. He ultimately called a seed bank in a nearby Mexican state to see if they had some. They did, and they took seeds out of their freezer bank so that he could sow them on his property. His goal is to begin the reversal of the extinction of this original Mexican corn. This wee ear of popcorn, the standard size for this variety, is just about four inches long. Look how beautiful it is, with its crystalline white and golden triangular kernels. Mexico still grows and cooks with 59 different varieties of native corns, corns that are essential to the regions in which they grow. A type of native corn that grows well in the state of Tamaulipas, for example, will probably not produce as well in Oaxaca. Nor will a native corn that is easily produced in the west-central state of Guerrero grow well in the north-eastern Mexico state of Coahuila. Climates differ, altitudes differ, soils differ: all impact Mexico's native corns. If you click on the poster to enlarge it, you'll see how very, very different Mexico's 59 corn varieties are from one another. Click on any photo to enlarge it for a better view. Photo courtesy CIMMYT. These multi-colored mazorcas are native to the Mexican state of Tlaxcala, the smallest state in the República. These elotes (ears of freshly harvested young corn) are native to the state of Michoacán. These large fresh ears are elotes of maíz cacahuatzintle, from the State of México, for sale earlier this summer at Mexico City's Mercado de Jamaica. This type corn is processed naturally so it can be used to make pozole, a pork (or chicken) soup with deliciously spicy broth. A bowl of pozole on a chilly night at the Mercado Medellín, Mexico City, a few Decembers ago. And finally, these mazorcas are native to the far-southern state of Chiapas. Mexico knows itself as 'the people of the corn'. Mexico knows that sin maíz no hay país--without corn, there is no country. Right now, Mexico is at a crisis point, the point of preserving its heritage of corn--or allowing that heritage to be lost to the transnational producers of uniform, high-yielding, genetically modified corn that is not Mexico's corn. The Chinese characters in the photo mean crisis, defined as both danger and opportunity. Which word will Mexico choose to safeguard its heritage and frame its future? I take my stand on the side of the 11,000 year history that defines us. Celebrating the first of June--with a taco made with a real tortilla: freshly nixtamalize-d native Mexican dried corn ground into damp masa (corn dough), patted or pressed out, and cooked on a comal (griddle) at Tortillería Ichuskata, in Morelia, Michoacán. I had been to a food event in the city and brought a half-kilo home with me--they're so delicious, it didn't even matter what was in the taco--the tortilla was just perfect! If you've never eaten a real tortilla--not from a plastic package, not even from the general run of tortillerías--you haven't enjoyed one of life's greatest pleasures. Anything else just isn't worth it. In Mexico, our presidential election is held every six years on July 1. Just after casting the ballot, your thumb is stamped to show that you voted. Every election since 2006, I've voted for the candidate who won the presidency this year: Andrés Manuel López Obrador. I'm so thrilled and proud that he won! That's my thumb, hiding my grin! Pesca del día--catch of the day on July 28--at Restaurante Pasillo de Humo, Mexico City. The robalo (Centropomus mexicanus), cooked perfectly and with a crisp, delicious skin, is served over a heap of freshly cooked vegetables. In this case, there were fresh fava beans, fresh peas, fresh corn, and the tiniest whole fresh carrots. Pasillo de Humo is consistently marvelous, and this fish preparation is no exception. Mexico Cooks! spent the first two weeks of August leading two back-to-back tours in Oaxaca. One of the must-do markets in Oaxaca is in Tlacolula, south of Oaxaca City, where my early-August group exclaimed over everything they saw, including the gorgeous rambutan displays. The rambutan, an Asian fruit grown extensively in Mexico's southernmost state of Chiapas, is similar to the lychee, but as you can, see the red skin has long red feelers--well, maybe not quite feelers, but don't they look like feelers? Inside the flesh is white, like the lychee, with a similar texture, flavor and a similar stone. You can find just about anything you need at Mexico's markets, including household goods, fruits and vegetables, and brassieres of uplifting colors. In Tlacolula this past August, we also saw wheelbarrows full of beautifully ripe, Oaxaca-grown melón (cantaloupe). The deep orange flesh is perfect, slightly tender, running with sweet juices, and ready for your table at any meal of the day. Mexican home and restaurant cooks also make an agua fresca (fresh fruit water) with melón; it's one of my favorites. Photo courtesy Mi Mero Mole. Cut the peeled cantaloupe into chunks. Put the chunks of fruit, the sugar, and 2 cups of water in a blender. Blend for 30 seconds. Add another cup of water and blend for an additional 30 seconds. Pour the blended mixture into a pitcher and add the remaining 3 cups of water. Stir until completely mixed. The cantaloupe water should be chilled before serving. Just prior to serving, stir the pitcherful again, with a large spoon. **Note: if you prefer this agua fresca a bit sweeter, add more sugar to taste. You can also replace all of the sugar with an equal amount of Splenda granulated no-calorie sweetener. My second August tour group was invited to a private traditional cooks' event, organized just for us by Srta. Petra Cruz González, the president of the Unión de Palmeadoras (Tortilla Makers' Union) in Tlaxiaco, Oaxaca. Tlaxiaco is located high in the Mixteca Alta about 2.5 hours north of the city of Oaxaca. 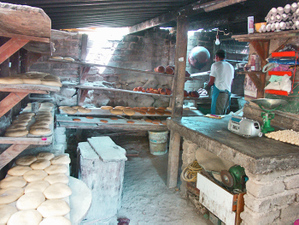 Several of the union members demonstrated how Oaxaca-style tortillas are made, and then invited us to partake of a comida (main meal of the day) that the women had prepared for us. In the photograph, you see a freshly made blue corn tortilla filled with requesón (a spreadable white cheese similar to ricotta), delicious frijoles de la olla (whole beans just out of the cooking pot), a bit of chicharrón (fried pork skin, the light brown square at the top left), and spicy salsa, made in a molcajete (volcanic stone grinding bowl). Was it good? Yes it was! The home made food, cooked over wood fires, was simple, heart-warming, and exactly what we needed. We ate and drank and chatted with the cocineras traditionales (traditional cooks), enjoying their company as much as we enjoyed their food. After the tours in Oaxaca, I came home to Mexico City to this new member of the family. When I picked her up mid-August from her rescuer, Pili was a tiny eight weeks old. Today, she's six months old and is fully integrated into the group the boss of the bunch--and certainly MY boss. Neither the three other cats in my household nor I stand a chance against Her Highness. Above, a quesadilla sin queso (quesadilla without cheese). "With or without cheese" is a perpetual discussion among people who live in Mexico City. One faction says, "A quesadilla doesn't need cheese." The other side says, "It has to have cheese, why else is it called quesadilla?" The one in the photograph, prepared with chicharrón prensado (the pressed-together ends and various leavings in a pot used to fry pig skins) at a Sunday flea market just north of Mexico City's Centro Histórico, has no cheese. Regardless of which side of the cheese/no cheese argument you're on, you'd love to have this for breakfast. In central highlands of Mexico, September is the middle of the rainy season, when nearly daily rains wet our mountainous oak and pine forests. Beneath the trees, many varieties of wild mushrooms spring up each night, to be harvested in the morning and brought to market. The bounty of the nightly harvests grace both home and restaurant tables; Mexico Cooks! buys setas and oyster mushrooms like those in the photograph, as well as many other wild varieties. Photo courtesy Rafael Mier. Meet Sra. Georgina Gómez Mejía, who sells wild mushrooms during their season at the Mercado de Jamaica in Mexico City. Depending on what she finds in the forests near her home in the neighboring State of Mexico, she brings lobster mushrooms, oyster mushrooms, hens and chickens mushrooms, chanterelles, and morels, the king of wild mushrooms. In mid-September, I bought two kilos (about 4.5 pounds) of enormous wild mushrooms from her and made enough mushroom soup to eat, to freeze, and to give to friends. Here, the October setting for a private dinner for 100 people in Morelia, to which I was invited by city government. The dinner, prepared and mounted by Restaurante La Conspiración de 1809, took place in the Palacio Municipal de Morelia in the Centro Histórico of that city. The building dates to the late 18th century and was the perfect location for the event, which included not only a multi-course meal, wines and other drinks, but also a play, presented on the stairway in the photo and throughout the entire room. It was an evening of tremendous excitement and delight, in every respect. Mid-Fall, we begin to see romeritos (in English, the awful name seepweed) in our Mexico City markets. Romeritos are a leafy herb that looks somewhat like a softer, non-woody version of rosemary. The long, skinny leaves look similar to the thin needles of the rosemary plant, growing like feathers along a central stem. Unlike the stiff stems and needles of rosemary, romeritos are soft and floppy, more like a succulent, with a slightly acidic taste. Generally eaten at Christmastime, they are cooked in mole and accompanied by patties of dried shrimp. In November I was surprised to see these enormous yaca (jackfruit) in a Mexico City supermarket. The biggest ones in the photo are about 24" long! Usually the fruit is opened and sold in segments, by weight. Inside, the orange-colored flesh is encapsulated into small pieces. It grows on Mexico's coasts. To the right of the yacas is a bin of tunas--in English, they're known as prickly pear cactus fruit. Making longaniza, a spicy sausage very similar to chorizo, at the Mercado de Jamaica. November 2018. The first week of December, a young friend in Baltimore and I had a ball with a long-distance bakeoff, each of us preparing the same recipe for blueberry coffee cake, at the same time, but she in Baltimore and I in Mexico City. It was enormously fun to do this! If you have teenage grandchildren in a city far from where you live, I think this would be wonderful to give you something to do together--choose a simple recipe that you would both enjoy, send one another photos of the process as you're doing it, and take the first bite at the same time. I know my friend Bea and I felt that we were doing something together despite the physical distance between us. Sunshine and shadows at the Casa Museo Friday Kahlo, in beautiful Coyoacán. Stairway at the Palacio de Correos de México (Mexico's main post office), Centro Histórico. The first stone was laid in 1902, the building was finished in 1907, and was almost destroyed in Mexico City's September 1985 earthquake. The building was restored in the 1990s. Pozole at the Mercado Navideño (Christmas market) at the Mercado Medellín, Colonia Roma. Finally, an arbolito de navidad (Christmas tree) at the Mercado de Jamaica. Decorated with tiny lights and ornaments, the owner of this market booth also hung the tree with the product he makes and sells: crisp corn tostadas! Adorable! Mexico Cooks! hopes that 2019 brings all of you the best of everything throughout the year. Come along with us as we see more of Mexico, her cultures and her cuisines--see you next Saturday! Most Mexicans eat traditional rosca de reyes (Three Kings' Bread) on January 6. Its usual accompaniment is chocolate caliente (hot chocolate). 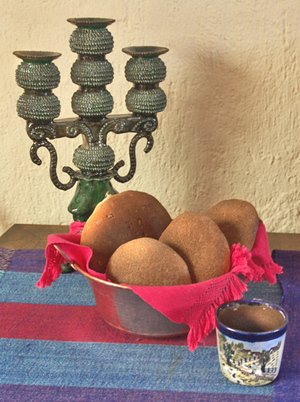 Typically, Mexican families celebrate the festival with a rosca de reyes (Three Kings' Bread). The size of the family's rosca varies according to the size of the family, but everybody gets a slice, from the littlest toddler to great-grandpa. Accompanied by a cup of chocolate caliente (hot chocolate) or an atole (a corn masa (dough) thickened, hot and often fruit-flavored drink), it's a great winter treat. A friend who lives and works in the northern state of Tamaulipas recently wrote a bit about the significance of the rosca. He wrote, "The rosca de reyes represents a crown; the colorful fruits simulate the jewels which covered the crowns of the Holy Kings. The Kings themselves signify peace, love, and happiness. The Niño Dios hidden in the rosca reminds us of the moment when Saint Joseph and the Virgin Mary hid the Baby Jesus in order to save him from King Herod, who wanted to kill him. The three gifts that the Kings gave to the Niño Dios represent the Kings (gold), God (frankincense), and man (myrrh). "In Mexico, we consider that an oval or ring shape represents the movement of the sun and that the Niño Dios represents the Child Jesus in his apparition as the Sun God. Others mention that the circular or oval form of the Rosca de Reyes, which has no beginning and no end, is a representation of heaven--which of course is the home of the Niño Dios." On January 6, 2009, Paty Mora de Vallejo, wife of Morelia's mayor Fausto Vallejo, served a slice of the enormous rosca de reyes monumental moreliana, prepared jointly by bakeries from everywhere in the city. 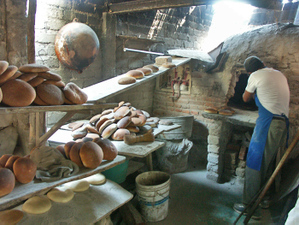 Everywhere in Mexico, bakers prepare an annual monumental rosca for the whole city to share. The rosca pictured above contains nearly 3000 pounds of flour, 1500 pounds of margerine, 10,500 eggs, 150 liters of milk, 35 pounds of yeast, 35 pounds of salt, 225 pounds of butter, 2000 pounds of dried fruits, and 90 pounds of orange peel. The completed cake, if stretched out straight, measures two kilometers in length! 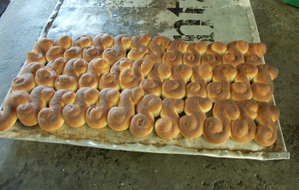 Baked in sections, the gigantic rosca is the collaborative effort of ten bakeries in the city. The city government as well as grocery wholesalers join together to see to it that the tradition of the rosca continues to be a vibrant custom. The plastic niño (baby) baked into our rosca measured less than 2" tall. The figures used to be made of porcelain, but now they are generally made of plastic. See the tooth mark on the head? Mexico Cooks! is the culprit. 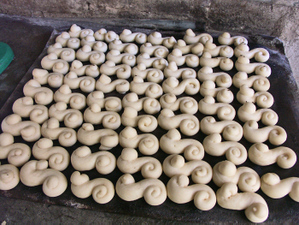 Every rosca de reyes baked in Mexico contains at least one niño; larger roscas can hold two, three, or more. Morelia's giant rosca normally contains 10,000 of these tiny figures. Tradition demands that the person who finds the niño in his or her slice of rosca is required to give a party on February 2, el Día de La Candelaria (Candlemas Day). The party for La Candelaria calls for tamales, more tamales, and their traditional companion, a rich atole flavored with vanilla, cinnamon, or chocolate. Several years ago, an old friend, in the throes of a family economic emergency, was a guest at his relatives' Three Kings party. He bit into the niño buried in his slice of rosca. Embarrassed that he couldn't shoulder the expense of the following month's Candelaria party, he gulped--literally--and swallowed the niño. El Día de La Candelaria celebrates the presentation of Jesus in the Jewish temple, forty days after his birth. The traditions of La Candelaria encompass religious rituals of ancient Jews, of pre-hispanic rites indigenous to Mexico, of the Christian evangelization brought to Mexico by the Spanish, and of modern-day Catholicism. In Mexico, you'll find a Niño Dios of any size for your home nacimiento (Nativity scene). Traditionally, the Niño Dios is passed down, along with his wardrobe of special clothing, from generation to generation in a single family. The presentation of the child Jesus to the church is enormously important in Mexican Catholic life. February 2 marks the official end of the Christmas season, the day to put away the last of the holiday decorations. On February 2, the figure of Jesus is gently lifted from the home nacimiento (manger scene, or creche), dressed in new clothing, carried to the church, where he receives blessings and prayers. He is then carried home and rocked to sleep with tender lullabies, and carefully put away until the following year. Each family dresses its Niño Dios according to its personal beliefs and traditions. Some figures are dressed in clothing representing a Catholic saint particularly venerated in a family; others are dressed in the clothing typically worn by the patron saints of different Mexican states. Some favorites are the Santo Niño de Atocha, venerated especially in Zacatecas; the Niño de Salud (Michoacán), the Santo Niño Doctor (Puebla), and, in Xochimilco (suburban Mexico City), the Niñopa (alternately spelled Niñopan or Niño-Pa). This Xochimilco arch and the highly decorated street welcome the much-loved Niñopan figure. The veneration of Xochimilco's beloved Niñopan follows centuries-old traditions. The figure has a different mayordomo every year; the mayordomo is the person in whose house the baby sleeps every night. Although the Niñopan (his name is a contraction of the words Niño Padre or Niño Patrón) travels from house to house, visiting his chosen hosts, he always returns to the mayordomo's house to spend the night. One resident put it this way: "When the day is beautiful and it's really hot, we take him out on the canals. In his special chalupita (little boat), he floats around all the chinampas (floating islands), wearing his little straw hat so that the heat won't bother him. Then we take him back to his mayordomo, who dresses our Niñopan in his little pajamas, sings him a lullaby, and puts him to sleep, saying, 'Get in your little bed, it's sleepy time!" Even though the Niñopan is always put properly to bed, folks in Xochimilco believe that he sneaks out of bed to play with his toys in the wee hours of the night. Trajineras (decorated boats) ready to receive tourists line the canals in Xochimilco. Although he is venerated in many Xochimilco houses during the course of every year, the Niñopan's major feast day is January 6. The annual celebration takes place in Xochimilco's church of St. Bernard of Sienna. On the feast of the Candelaria, fireworks, music, and dancers accompany the Niñopan as he processes through the streets of Xochimilco on his way to his presentation in the church. Gloria in Xochimilco with Niñopa, April 2008. Photo courtesy Colibrí. Blue papel picado (cut paper decoration) floating in the deep-blue Xochimilco sky wishes the Niñopan welcome and wishes all of us Feliz Navidad. El Día de La Candelaria means a joyful party with lots of tamales, coupled with devotion to the Niño Dios. For more about a tamalada (tamales-making party), look at this 2007 Mexico Cooks! article. From the rosca de reyes on January 6 to the tamales on February 2, the old traditions continue in Mexico's 21st Century.